Joint discomfort is common in companion animals, with as many as 25% of dogs experiencing joint discomfort. Joint problems are especially common in older dogs, overweight dogs, and heavily inbred dogs like dalmatians. 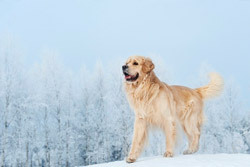 As with humans, dogs and other pets can experience worsened joint pain in the wintertime. Like humans, canine joints and muscles tend to be stiffer and more tender in colder weather. Some human and animal studies suggest that wintertime dampness and changes in barometric pressure may aggravate joint problems. A number of things can be done to ease the joint discomfort of dogs, cats, and other companion animals during wintertime. Moderate exercise is vital for keeping dogs joints and muscles in top shape. In many areas, dogs can exercise in dog-friendly parks or dedicated dog parks. Many communities in cold climates also have doggie gyms and activity centers where dogs can exercise in extremely cold weather. Weight reduction for overweight dogs is oftentimes very useful in relieving joint problems. A number of special low calorie dog foods are now available for overweight dogs. Additional exercise is often helpful in helping overweight canines trim down. It is important to keep dogs warm and comfortable in cold weather. Even though dogs have fur coats, dogs can still experience life-threatening hypothermia if keep outside for long periods in cold weather and/or if they become wet while outside in cold weather. Dogs with short-hair and/or older dogs are especially susceptible to the effects of cold weather. Dog coats, sweaters and booties are useful for walking dogs in cold weather. A comfortable dog bed or other sleeping area is often helpful for dogs with joint problems. Ramps or steps are also helpful for dogs with joint problems to climb upstairs, into cars, or into chairs or higher furniture. Canines with sore joints can also be helped with water exercise and physical treatments like massage or acupuncture/acupressure. Good nutrition and supplements can also help ease canine joint problems. Omega 3 fatty acids are known to be very good for overall health, including some joint issues (1). Dogs can obtain greater omega 3 by eating high omega 3 formulas, by chewing omega 3 supplements, or by having fish oil added to their food. If your dog experiences more serious joint issues, many studies with animals and humans have reported that certain herbs can be helpful in improving joint issues. Supplements with turmeric can significantly improve symptoms in dogs with joint problems as compared to those given a placebo (2). Another study reported that boswellia supplements significantly improved joint function in 17 out of 24 dogs (71%) with chronic joint problems (3). DGP from American Biosciences is a unique formula of marine collagen extract, boswellia extract, corydalis root, wheatgrass, turmeric, feverfew, celery seed extract, wild rosella, capsicum extract, aniseed myrtle, mountain pepper, bromelain, and papain. Many of the other herbs and enzymes in the formula have been shown to be helpful for joint problems in humans or non-canine animals. DGP is available in a convenient bottle of 60 tablets which can be chewed whole or added to your dog’s food. Use common sense handling your dog in cold weather. If it is too cold for you, it is too cold for your dog to be outside for any extended period of time as well. Snuggling on the couch together is a fun way to keep you both warm and happy until warmer spring weather arrives! 1.Vandeweerd JM, Coisnon C, Clegg P, et al. Systematic review of efficacy of nutraceuticals to alleviate clinical signs of osteoarthritis. J Vet Int Med 2012;26:446-456. 2. Innes JF, Fuller CJ, Grover ER, Kelly AL, Burn JE. Randomized, double-blind, placebo-controlled parallel group study of P54FP for the treatment of dogs with osteoarthritis. Veterinary Record 2003;152:457-460. 3. Reichling J, Schmokel H, Fitzi J, Bucher S, Saller R. Dietary support with Boswelia resin in canine inflammatory joint and spinal disease. Schweiz Archives Tierheilkd 2004;146:71-9.